This last Bank Holiday – the May Day one – involved a very enjoyable trip to see friends, new and old, first in Somerset and then in Dorset and Hampshire. The trip took in Bruton, Highcliffe and the New Forest. It also involved a great deal of photography. This is one of dozens of shots taken on the trip. I liked it because it highlighted what could be, at first sight, quite an anonymous thing. 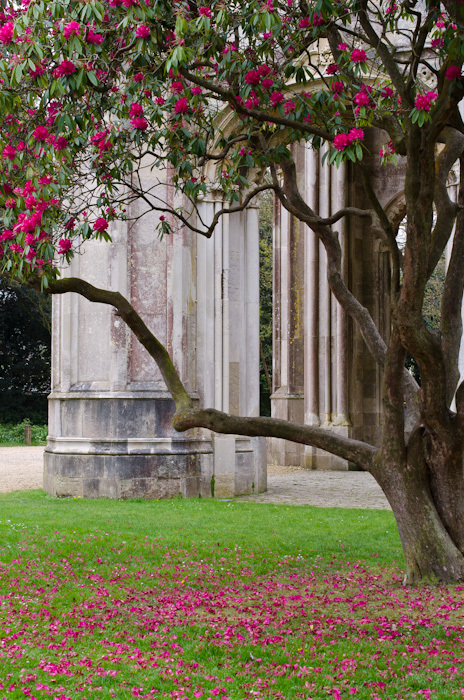 That is to say, Highcliffe Castle, its grounds and location are so beautiful overall that one tree might not get much attention. I felt, however, that this one had something eye-catching and special about it, because of the visual poetry of the intensely coloured fallen blossoms echoing those still attached. Also, the smoothly carved, vertical lines of the stonemasonry seem, to my eyes, to work well in juxtaposition with the tangle of branches.